Fossil fuel energy is the lifeblood of the modern world. Before the Industrial Revolution, humanity depended on burning wood and candle wax. But with the ability to harness the energy in oil and other fossil fuels, quality of life and capacity for progress increased exponentially. Thanks to incredible innovations in the energy industry, fossil fuels are as promising, safe, and clean an energy resource as has ever existed in history. Yet, highly politicized climate policies are pushing a grand-scale shift to unreliable, impractical, incredibly expensive, and far less efficient energy sources. Today, "fossil fuel" has become such a dirty word that even fossil fuel companies feel compelled to apologize for their products. 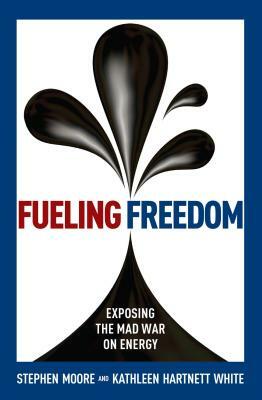 In Fueling Freedom, energy experts Stephen Moore and Kathleen Hartnett White make an unapologetic case for fossil fuels, turning around progressives' protestations to prove that if fossil fuel energy is supplanted by "green" alternatives for political reasons, humanity will take a giant step backwards and the planet will be less safe, less clean, and less free. STEPHEN MORRE is the distinguished visiting fellow in the Project for Economic Growth at The Heritage Foundation and the former senior economics writer for the Wall Street Journal. His most recent book, co-authored with Arthur Laffer, is An Inquiry into the Nature and Causes of the Wealth of States. KATHLEEN HARTNETT WHITE is the distinguished senior fellow and director of the Armstrong Center for Energy and the Environment at the Texas Public Policy Foundation in Austin and the former chairman of the Texas Commission on Environmental Quality, the second-largest environmental regulatory agency after the EPA. She earned her bachelor's and master's degrees at Stanford and her law degree at Texas Tech. Her writing has appeared in numerous publications, including Forbes, National Review, and Investor's Business Daily.